Prime Minister Moses Nagamootoo, whose ancestors are Tamils, will be awarded the title of “Crown Jewel of World Tamils” as well as participate in several other key events for Tamils during an official visit to India. 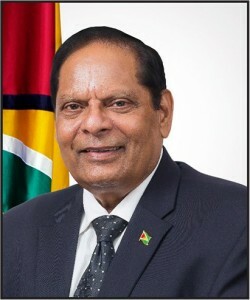 Nagamootoo’s office said that he was selected by the Award selection committee to receive the award on October 4th, 2016. During his September 29 to October 11 official visit to India, he would be participating in the “World Tamils Economic Conference” scheduled for Sunday October 2nd to Tuesday, October 4th, 2016, Tamil Nadu, India and the 29th Convocation of Bharath University, which will be held on Wednesday, October 5th, 2016. “He looks forward to forging stronger ties between Guyana and the World Tamil community, especially entrepreneurs and industrial leaders of Tamil Nadu. Guyana has an open-door policy that welcomes all investors and economic partners,” the Prime Minister’s office said in a statement. The aim of the World Tamils Economic Conference is to bring together the Tamils and Indian community in the world, in order to foster cooperation and tap the vast human and material resources for a collective growth. As Chief Guest of the 29th Convocation of Bharath University, he would be awarding the degrees and delivering the convocation address. Bharath University offers graduate and post graduate research programmes in the Faculties of Engineering & Technology, Medical & Health Sciences, Dentistry, Management, Law, Arts, Science and Humanities. The Prime Minister will also travel to New Delhi to participate in a “Delhi Tamil Advocates Association” programme scheduled for Thursday October 6th, 2016 at the “Plenary Hall, Indian Law Institute (Deemed University), Supreme Court Campus, New Delhi. Nagamootoo is accompanied by his wife, Mrs. Sita Nagamootoo and OPM Chief of Staff Mr. Omar Bissoon. Carl Greenidge, Minister of Foreign Affairs and Second Vice-President, will perform the functions of the Prime Minister. Prime Minister Nagamootoo is expected to return to Guyana on Wednesday, October 12, 2016.